Director/Producer – Alfred Hitchcock, Screenplay – Alec Coppel & Samuel Taylor, Based on the Novel D’entre les Morts by Pierre Boileau & Thomas Narcejac, Photography – Robert Burks, Music – Bernard Herrmann, Art Direction – Henry Bumstead. Production Company – Paramount. Police detective John Ferguson has retired from the line of duty after his fear of heights prevented him from stopping a colleague falling from a roof. His old college friend Gavin Allister hires him as a minder for Gavin’s wife Madeleine. As Ferguson secretly follows Madeleine, he observes her behaviour becoming increasingly eccentric. She is convinced that she is a reincarnation of another woman and that the other woman periodically takes over her personality. Ferguson saves her from an attempted suicide but afterwards she remembers nothing about it. They fall in love, only for the entranced Madeleine to jump to her death from a bell-tower, something that Ferguson’s vertigo prevents him from stopping. The experience places him in a mental institution. Released some time later, everywhere he sees other women who resemble Madeline. He then meets one woman Judy who seems an identical duplicate for Madeleine. He obsessively dresses her as Madeleine, unaware that she was the double for the real Madeleine and that he was duped into acting as a witness in an elaborate scheme to murder her. Alfred Hitchcock (1899-1980) was one of the great cinematic masters of the 20th Century. Hitchcock had emerged as a director in England before moving to the USA, making a number of excellent thrillers during the 1930s and 40s. However, it was in the 1950s and the point he moved into colour that Hitchcock reached the peak of his art. It was during this decade and slightly after that Hitchcock made classics such as Dial M for Murder (1954), Rear Window (1954), To Catch a Thief (1955), North by Northwest (1958), Psycho (1960) and The Birds (1963). Vertigo, which for many years was out of circulation, is often regarded as Hitchcock’s single masterpiece. (Although, in this author’s eyes that status belongs to Psycho – Vertigo is flawed by one gaping plot blunder in the middle – see below). Vertigo is unquestionably Alfred Hitchcock’s darkest film. It is particularly grim and depressing in tone, not even leavened with Hitchcock’s customary droll sense of humour. However, there is a magnificently subdued and brooding power to the film. There is a strong seductive thrill as we become involved in the unveiling mystery of Madeleine’s behaviour. 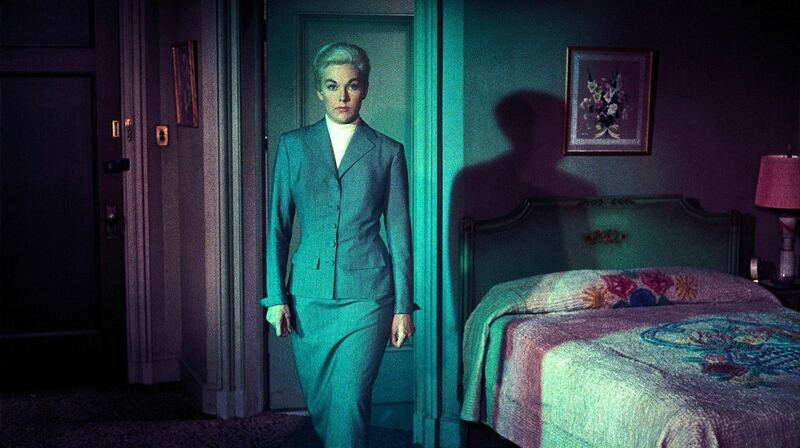 One of the most mesmerising sequences is the half-hour pursuit of Kim Novak by James Stewart, which continues for long periods only to the accompaniment of Bernard Herrmann’s sweeping, brooding score on the soundtrack. In these scenes, the locations almost become a third character in the film as Hitchcock takes us through a dream-like landscape of North California autumnal redwood forests, the Golden Gate Bridge in Technicolor splendour, old Spanish churches and turbulent shorelines covered with gnarled, twisted trees that sit like dark symbols in a dream. It is something that suggests no longer standardised American locations but an exotically beautiful Old World country hidden inside America. Vertigo suffer from a miscalculation on Hitchcock’s part. Namely, that he gives the twist ending away three-quarters of the way through, rather than leaving it to the end. After that point, one simply loses interest in the obsessiveness of James Stewart’s character, a person who seems fairly obtuse and unsympathetic from the start anyway – there seems no reason why the audience could not have made the discovery at the same his character did. Thereafter the film becomes less a thriller (of exceedingly contrived plotting) than it does a study in obsession. It is frustrating and hard to see why such a meticulous technician as Hitchcock could have miscalculated here. Hitchcock is not helped by unsympathetic performers. Kim Novak fails to bring any of the flirtatious coyness to the role that she also did in the same year’s Bell Book and Candle (1958) (where she also played opposite James Stewart). As a character, she is almost entirely opaque from us, while her secondary role as Judy has no depth to her whatsoever – we never find a single thing out about her. The ending the film finally arrives at is an abrupt downer. 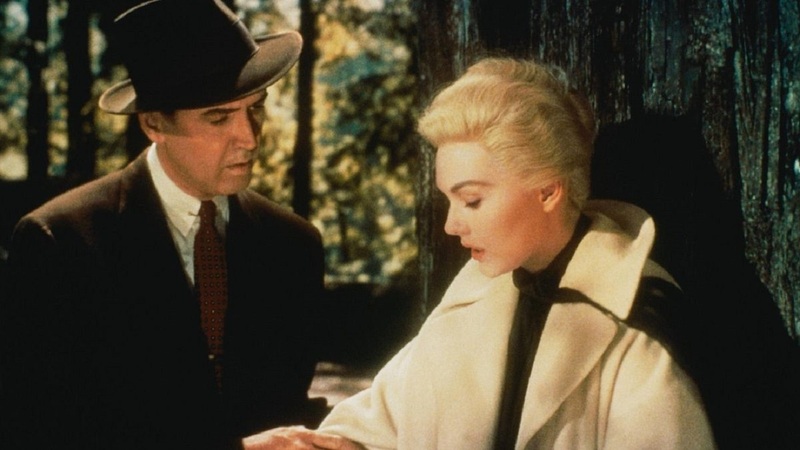 Vertigo has consistently been considered as Alfred Hitchcock’s greatest film. A 2012 poll by the British Film Institute and the critics at Sight and Sound magazine listed it as the No 1 greatest film of all time. Vertigo has had an enormous influence on a number of other films. It appears to be Brian De Palma’s favourite Hitchcock film – Obsession (1976) is a virtual remake, while the obsession over a duplicate woman plot reappears in his Body Double (1984). Influences and quotes can also be found in Jonathan Demme’s The Last Embrace (1979), Anthony Perkins’s Psycho III (1986), David Lynch’s Lost Highway (1997) and the Chinese thriller Su Zhou He (2000). The film was parodied in Mel Brooks’s Hitchcock spoof High Anxiety (1977). Alfred Hitchcock’s other films of genre interest are:– The Lodger: A Story of the London Fog (1927), Elstree Calling (1930), Shadow of a Doubt (1943), Rope (1948), Strangers on a Train (1951), Psycho (1960), The Birds (1963) and Frenzy (1972). Hitchcock also produced, introduced and occasionally directed the anthology tv series Alfred Hitchcock Presents (1955-62). Hitchcock’s life is depicted in the films The Girl (2012) and Hitchcock (2012). The film was based on a novel by two popular French thrillers writers, Pierre Boileau and Thomas Narcejac. Boileau and Narcejac also wrote the books that became the basis of the classic psycho-thriller Les Diaboliques (1955) and the transplanted limbs horror film Body Parts (1991), as well as the screenplay for the classic French mad surgeon film Eyes Without a Face (1959).